The Black Library, Laughing Boy’s Shadow, London Macabre, and any number of bleak visions besides… Steven, you’ve shown an unmistakable penchant for darkness. What attracts you to the dystopian and the morbid? Goodness me… erm. Ah. Hmmm. Honestly? I’m not. I know that sounds weird, but I can’t stand horror films, haven’t read a horror novel in probably a decade. The thing is, when I was first getting into writing, I was reading a load of fantasy, for a while it was a Michael Moorcock book a day, it was David Eddings, Stephen Donaldson, Lyndon Hardy, Hugh Cook, Roger Taylor, just anything and everything. I had about two hours on the bus every day, minimum, from Prudhoe in to Newcastle where I was at University and the time needed to be killed. BUT… I guess the fact I’d spend a decade working on horror stuff meant that my fantasy and even the thriller, Silver, wound up being grim… we’re a product of our environment, after all. You’ve written for adults and for a YA audience. How does your approach vary according to the intended audience? Hmm. There’s only one main difference, really, and that’s in tone. I don’t dumb down the language, for instance, but I shift the tone, aiming for something more ‘magical’ in the way the story is delivered. I think it probably sounds weird, but what I remember most from reading growing up was the fantastic feeling of encountering something for the first time… so I’m less conscious of say a brilliantly original idea and more conscious of hitting a really lovely way of delivering it. Do you have a preference for either? Which one, and why? I tend to love them both, but at different times. I need one to cleanse the palette when having done the other. I’ve spent probably six months out of the last twelve working on Moonlands stuff, and having an absolute blast with it, but in between all of that stuff I wrote Each Embers Ghost, an urban fantasy based in London, and Dark Waters, the adaptation of the new Risen 2 computer game (out in August). Heck, actually I also did Tau Ceti, my first ‘science fiction’ novella, in collaboration with Kevin J Anderson… all of this, of course, was to distract myself from the fact I had a new thriller to write, heh. You’ve been really prolific so far. How do you maintain the focus required for such a fecund career? See above. Really, it’s all about the popcorn theory. I have a lot of ideas, and I mean a lot. I can probably come up with a new idea for a series of novels three times a month, the trick is finding the one that really sings inside me. For a while now I’ve been writing full time – since 2005 – and it’s been difficult sometimes to make ends meet, and other times it’s been very comfortable. The thing is the need to eat can really help you focus. I decided to divide my career into two, the ‘tie-in’ and the ‘original’ using one to pay for the other and keep the food on the table and the roof over the head. I can write fast, or take my time, too, meaning I can do the one month deadline on a novelisation, or 9 months working on something like London Macabre. The trick is to keep feeding the creative soul. The satisfaction of finishing things. Doing the odd little quirky fun thing that isn’t all about food, like World’s Collider, which was too much fun to pass up. And lets be honest, I work hard. I put at least 6 hours a day in, arse in seat, writing. That’s aside from stuff like interviews, email correspondence etc. Just the concentrated effort of writing. That means I have time to do the stuff I love, too. You’ve been living in Sweden for some time now. Why Sweden? Are there any plans of coming back to the UK? I had my 15th anniversary last week. That’s longer than I’ve lived in any one part of the UK, by a long stretch. The why? Short version, I broke up with a girl and went on holiday and decided to stay. I love the quality of life out here, and can’t imagine living in the UK ever again, to be honest, I come back and see the grief left behind by the recession, the empty shops on the high street, and the general feeling of depression about the place, but there’s something weird about imagining being buried in a foreign country… but this is where my life is. The long version of the story’s not that exciting heh. A lot of your work has been based on television shows; Doctor Who, Primeval, Torchwood – just to name a few. Do you have any interest in writing screenplays in the future? Your work has provided inspiration for many. Where do you find your inspiration? That’s a ridiculously tough question when I actually try and think about it… I’ve always admired Clive Barker, especially for Weaveworld, but also for the way he’s managed his career, doing what he wants, be it movies, kids books, epic sprawling tales of magic and horror… computer games… you see a connection? When I was 19 I set myself a challenge, I wanted to be as successful as Barker was that day. 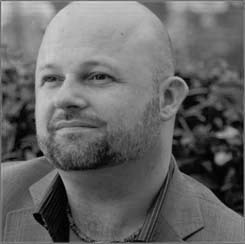 He was forty, and Weaveworld was just out in paperback… I had my fortieth not so long ago and did a count up, and whilst I might not have the name recognition etc I’ve done some amazing stuff, like writing the storyline for Battlefield 3, which sold what, 23m copies? I’ve had novels in getting on for a dozen languages, thanks to Primeval had a #1 UK bestseller in hardback, and thanks to Silver, had a #2 bestseller in ebook… I don’t feel like I let my 19 year old self down too badly. How was the experience of writing for World’s Collider for you? Well, in terms of books, August sees the release of a few projects, Risen 2, the novelisation of the computer game, via Penguin’s Sunbird list, and Each Ember’s Ghost, a modern day London fantasy/horror for the Fireborn RPG. You’re invited into a suspicious laboratory. A wild-haired, crazy-eyed professor offers you the chance to work on any science fiction project from the past. What do you choose? 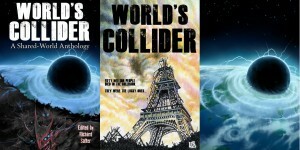 World’s Collider – a shared-world anthology, is now available to order from Amazon US, Amazon UK or in trade paperback direct from Nightscape Press.